If your business keeps track of members, or sells tickets for events, or just needs to obtain contact data from prospective customers who "opt in" to request information, a customized registration form automates the vital but tedious work of data capture. Clicking "Submit" on a secure online form instantly writes the individual's information to your database, eliminating the need for any manual entry or transcription. The form automatically emails a confirmation to the submitter, with a copy to the site's owner. Prospective customers' selections here help match them up with commercial clients, or specific product lines, for efficient targeted marketing and customer service. Click to see a detailed view. Offering a newsletter or another useful service is an effective way to induce prospective customers to register. 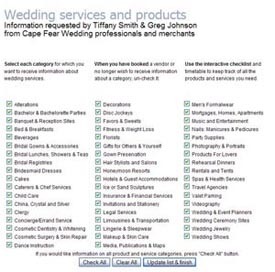 Enterprises that match commercial clients with prospects can filter this data according to business categories. That ensures that clients -- such as advertisers or trade-show exhibitors -- get only qualified leads, who have self-identified as having an interest in their products or services. Associations or subscription websites can capture membership information with this system. Members may be given the ability to log in and update their listings, using a variant of this form. 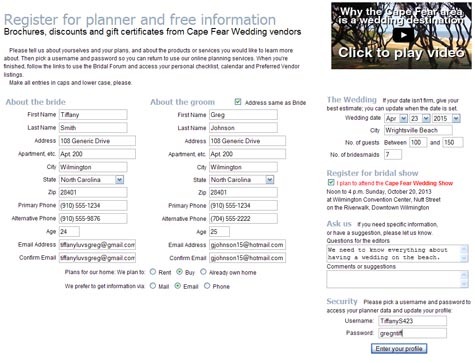 Enterprises focused on scheduled events, such as concerts, weddings, parties or vacations, can save dates in their databases. Those dates can then be used to generate automated reminders of deadlines and time-sensitive offers and opportunities. This form helps customers register for events, and request information from the merchants listed on this website. Similar forms can be used to manage a website's membership or subscription information.